Thich Nhat Hanh uses a wonderful analogy of waves and water to understand how the Ultimate and Historical dimensions of reality are interwoven. Waves rise, they fall and die when they wash up on a seashore or riverbank. This is the analogy for the Historical Dimension. Many other notions within time/space constraints situate the wave clearly within the historical dimension of viewing reality, which provides a metaphor for our daily existential cycle of life – our crises and cycles of ups and downs. But no matter what attributes apply to waves there is always a constant. While a wave is about its business of being high or low, born or dying, coming or going, it is always water. The constant of water refers to the Ultimate Dimension. With the interconnected nature of waves and water, the idea is that if we touch the waves of life deeply with our insight then we can touch the water of life – the Ultimate Dimension that we can call Nirvana, the Kingdom of God. This is a transcendent reality, a dimension outside of time and space, distinct from the time and space constraints of our daily existence. I have heard Thich Nhat Hanh many times express the waves and water analogy, and the metaphorical qualities certainly made intellectual sense to me. But my experience was such that deep looking into my waves did not lead me to touch the water of the Ultimate Dimension. My “Waves” did not shoot me through to the “Water” as I certainly expected them to do, after listening to my teacher. I wondered for a long time about this disjunction between my intellectual acceptance of this notion and my lack of personal experience. There were three logical options for me to investigate. I eliminated the first option as I have great trust and faith in Thich Nhat Hanh as a teacher. There may be something to the second option as I know how generous a teacher he is, that he may choose to encourage rather than chart the difficulties on the path. Yet, I realized very early on that the real investigation was the third option – to investigate just what was missing from my practice of mindfulness. I was aware that my waves were too small to carry me through to the Ultimate Dimension – too small in terms of insufficient concentration, insight and mindfulness – the three energies of transformation. What I needed was a tidal wave to make my waves full of concentration, insight and mindfulness so that this energy could provide the “voltage” to transition from waves through to water. I knew that a tidal wave has the properties of increasing energy and appears to disobey the second law of thermodynamics. It is described as a “soliton” in science, with characteristics of both wave and particle and therefore a kinship with elementary particles such as the photon and electron. So my investigation was into my internal state for the causes and conditions that would make my waves into “solitons” – into tidal waves full of concentration, mindfulness and insight. As I pondered this deeply I stumbled across where I had to go. It was into Silence. Deep Silence and stillness amidst the world I lived in. This is where I found the causes and conditions that would provide tidal waves of energy to my cells and consciousness. Silence producing Tsunami was the initial equation. I could truly look deeply into my suffering, into the dark areas that held hostage my mental formations of an unwholesome nature. And so over the past decades I have built more and more silence into my everyday life. On a daily basis I stop, look deeply and dialogue with the feminine seeds in my consciousness – a practice received from my Native American medicine teachers. I listen deeply in the silence to the communications from the wholesome attributes of feminine wisdom within me to address issues and questions. For a long time now this has been, and still is, my fieldwork of life – observation and understanding the field of consciousness within me through the eyes of the internal feminine. Silence and skilful deep looking were certainly important yet the dialogue with the internal feminine was the key for me. My consciousness was guided by these seeds of awareness to transform difficulties and impediments in my life, enabling me to move on. My home and sangha life, supported by the entire Pine Gate Sangha, enables me to retreat into silence on a regular basis. In this way – through silence and deep looking – my waves became bigger, more infused with concentration, insight and mindfulness. Deep silence and dialogue with the internal feminine provided the causes and conditions for my waves to become Tsunami. As I continued to stop in the silence and look deeply into my shadows, there emerged the distinct experience of touching the water. Thich Nhat Hanh was correct. I had to discover for myself the significance of silence, skilful deep looking and consulting with the wisdom of the internal feminine. The fruits of this practice of silence and non-action were many and particularly manifest in my study of the Lotus Sutra. Silence had given me a better understanding and experience of the Ultimate and Historical Dimensions. I applied myself to study the Lotus Sutra, particularly Burton Watson’s 1993 translation from the Chinese version done by the Central Asian scholar-monk Kumarajiva in 406 CE. Prior to this intensive study I was much more comfortable with accepting the Buddha in Historical form. The story of the Buddha’s life, awakening and ministry was enough for me and I had not paid too much attention to the Buddha in the Ultimate Dimension. That changed radically through reading the Lotus Sutra from my practice of silence. For in the Lotus Sutra the Buddha in the Ultimate Dimension is revealed in no uncertain terms. In its beauty, grandeur and compelling intimacy with all that is, ever was, and ever will be, my scepticism about the Ultimate Dimension of the Buddha disappeared. As I read different chapters of the Lotus Sutra I was transported to the worlds and dimensions described. I would read a little then put the book down as I felt myself going deeply into meditation. I was profoundly moved by the words, the dimensions, by the energy that I experienced through the series of translations into Chinese then into English. And I would remain in a trance like state for hours. My wife Carolyn would come home from work, take one look at me and say: “You’ve been reading the Lotus Sutra again, haven’t you?” She was right! My direct experience of the energy of this Mahayana masterpiece brought home to me so many insights. The most pertinent one was that I would not be able to experience the Lotus Sutra in this way if my waves were still too small – lacking in insight, concentration and mindfulness. Over the years I took steps to remedy my small wave syndrome as best I could, through protracted periods of deep silence and skilful deep looking. I still continue with this practice. Without the silence and what it enabled, I am sure I would have had a different experience from my study of the Lotus Sutra – a superficial reading that would not have allowed me to touch its depth and magnificence. The Lotus Sutra is full of the activities of bodhisattvas, sages and holy beings, and of how we may understand their role. The bodhisattvas are described as being immersed in the Ultimate Dimension, and from there they return to the Historical Dimension to transform suffering. This is the Action Dimension – shaped for us through the Six Paramitas – plus one – Upaya! As “water” bodhisattvas live the life of a “wave.” Their example in choosing to do so encourages us to come face to face with suffering, to step away from fear and take our own steps into freedom. This is the task of the true revolutionary of the twenty first century. Not to pick up a gun and shout hatred, but to penetrate “Water” from the “Waves” of life. There are so many bodhisattvas from all spiritual traditions who are choosing to do this. In a way this ushers in the end of Religion – of being attached to the identity gained from one’s religion. The task before us in the 21st century is to step out as Spiritual Warriors and not be caught by our religious identities but to connect and walk hand in hand with friends from other spiritual traditions who are doing the same. Thus I am expanding the term bodhisattva so that it embraces far more than Buddhism. I came through this process with waves that are not so small anymore, with joy and happiness, and a full heart to share with everyone. I also experience a distinct cycle of interconnectedness. Empowered by my study of the Lotus Sutra, I institute yet more silence into my life even when I am talking to someone or offering a dharma talk. I became available to the Three Gems in a manner I was not before. My waves carry more voltage and my Seven Paramitas are filling up rather than being half empty as my skillfulness grows. My activism for peace and the environment rests on a foundation of silence and the initial necessity of non-action. The true art of doing nothing! It all weaves together like a spider’s web glistening in the morning dew. It is so lovely. 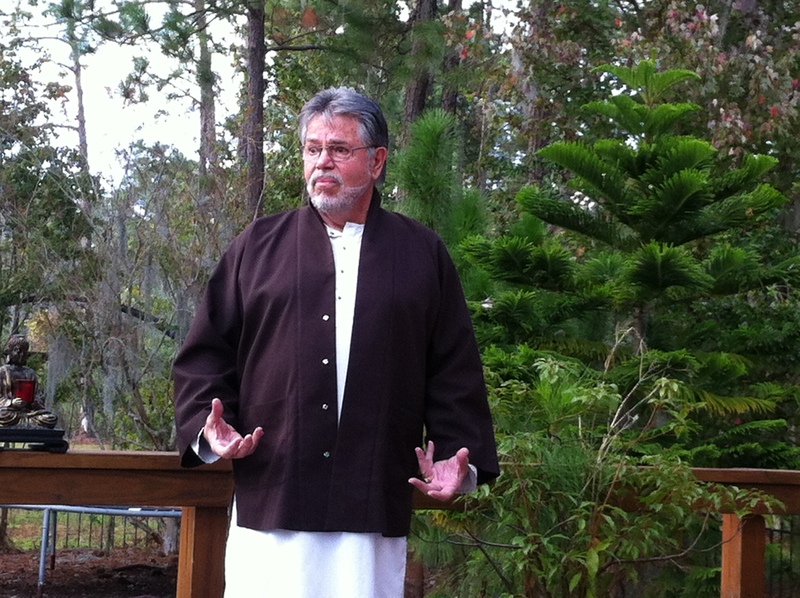 I offer my insight gatha when receiving the Lamp Transmission from Thich Nhat Hanh in Plum Village, France. The exercises are to be completed preferably in a group, as the real fire for cooking insight is in sharing. The sharing is strictly confidential and remains in the process and is not communicated outside. This builds trust and protects everyone participating as sangha friends. The six exercises are to root your experience in sangha practice. You may have specific agendas in front of you at present, however, I think a deep dive into re-examining the 14 Mindfulness Trainings will solidify things for you. The first task is to learn and sing “The Incense Offering” and “Invitation to Meditation.” They are the first and last track on the Pine Gate meditations CD. I am sure Carolyn will be happy to help you with the singing! Find someone to sing it with and have fun as you sing it together over the phone. The second task is to reflect on and rewrite the first two mindfulness trainings in your own words and from your own experience and suffering. Share this task with others. I should emphasize that there is no right way of doing the reflecting and rethinking of the MT’s. It is all in the sharing with buddies – you can rewrite, or paint or make up a poem, dance or song from your insights, prepare a skit, create a photo essay etc. How you express your own experience of the MT’s is not at all restricted to the written form. I hope that you feel free to express yourselves as you wish to. It is the sharing process that provides the real “fire” of understanding. This is a very important point. Take one another’s phone numbers and perhaps arrange a monthly coffee sharing before you come and see me. Living Dharma/ MT 12, 13 & 14 (Exercise 6). After each exercise provide a brief report, which will be of assistance to others. Interbeing rocks on! I hope to create fun and a good environment for the mentoring. Singing on…. The second exercise involves your rewriting of the 3rd and 4th Mindfulness Trainings. Once again drawing on your own experience and words. This is so the MT’s become personal, not just something you recite by rote. The meaning to you of each training thus deepens. Do share the rewritten MT’s with your buddies. That is a vital stage of the exercise. The singing continues with the second exercise of the training program, this time with some study. The focus is on Thay’s new version of “The Heart of the Prajnaparamita.” First of all learn to sing it, with the bell at the appropriate time. To study this keystone of practice – read it and sing it through a few times and jot down what insights come to you. Then turn to the UK sangha’s Manual of Practice. The UK sangha have produced an excellent manual of mindfulness practice. Chapters 1 – 4 give explanations of the basic teachings and guidance on following the practice in our daily life. It is now available as a web based on-line book. For the Heart Sutra study – be aware that there is a dance between the Ultimate and Historical Dimensions. What does “No attainment” mean in the Historical as opposed to the Ultimate? If we try to understand it in the Historical we get stuck as it belongs in the Ultimate Dimension. What does “no eyes, no ears etc” tell you about perception through the senses? Go deep with this one. An article that charts my difficulties with these two dimensions is available from my website. Go to http://www.ianprattis.com/articles.htm and download “My Practice in the Ultimate and Historical Dimensions.” Take your time with this “homework” and enjoy the exploration together. The Third Exercise in the OI training program is to rewrite MT’s 5, 6 & 7 from your own experience and suffering. The study is for you to take one of the fifty verses from Thay’s book “Transformation At The Base.” Whichever verse appeals to you the most. Then make that verse your meditation and contemplation focus for the next month. Have a notebook handy to jot down insights and questions that arise. A chapter that appears in Vol II of Keeping Dharma Alive E Book would be useful to examine. The chapter draws on Thay’s Fifty verses in large measure and is titled “Consiousness As Food.” After you meet together, once more write a brief report and then come to meet with me. There is a lot to this exercise so take your time with it – can even stretch over two or three months. The fourth exercise is to rewrite the next two mindfulness trainings – 8 & 9 – once again from the perspective of your own experience. The study portion of Exercise Four asks you to take a chapter from “Friends on the Path” compiled by Jack Lawlor, or a chapter from Thay’s “Living Joyfully.” Present your thoughts on different chapters to one another with your reflections and insights about sangha building in your own practice community. Also take a look at the experience of the Pine Gate sangha at: http://www.ianprattis.com/pinegate.htm Then report about the nature of your discussion and insights. The fifth exercise brings your attention, experience and skills to mindfulness trainings 10 & 11. The study portion has its focus on Engaged Buddhism, which is the heart of Thay’s practice and teaching. There are many books and teachings on Engaged Buddhism. Select a particular chapter or dharma talk from Thay that appeals to you and use this as the basis for your discussion with your fellow aspirants. There is also a dharma talk about Engaged Buddhism on YouTube. “The Small God Limited Dharma Syndrome”, which is a chapter in “Keeping Dharma Alive” addresses these issues in the context of conservative and fundamentalist hierarchies within North American spirituality. It is available from http://www.ianprattis.com/articles.htm and will also be sent to you as a Word File. It has been a privilege to share this journey, a deep bow to each one of you. I turn to my teacher Thich Nhat Hanh (Reconciliation: 2010: 64) to open a discussion on understanding suffering. Ian is the resident teacher at Pine Gate Mindfulness Community. On Facebook search “Pine Gate Sangha” for program, discussions, events and humour.